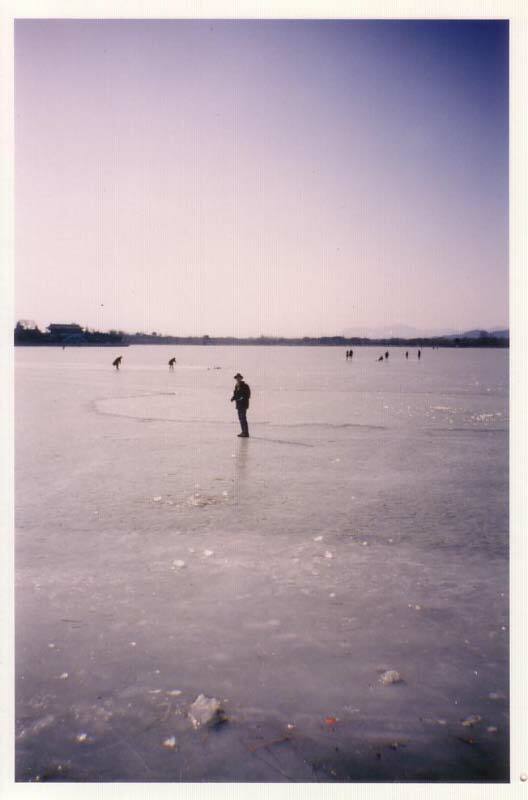 Doing a fair amount of ice & inline skating - respectively during Winter and Summer - but so far I've only gone rogue over frozen water in Harbin (Songhua river), the Summer Palace in Beijing (Kunming lake see last photo below from 1992) and as a teenager at Boekenbergpark in Antwerp (bit less exotic location). Instead of going indoor again, I stumbled upon a great public forum from the "Belgian Inline Center vzw" at www.belgianinlinecenter.be, so I was able to scout for skateable outdoor surfaces in Flemish Brabant. One pond in nature reserve "Doode Bemde" immediately made it to the top of my shortlist, so I immediately drove off to the valley of the Dijle river South-West of the city of Leuven. At Neerijse I parked my car near the double-towered church, and walked about 1 to 2 kilometers Eastbound into the "prairie" (a "beemd" is an ancien word used in North-Brabant to indicate a treeless grassy parcel of land near a stream). 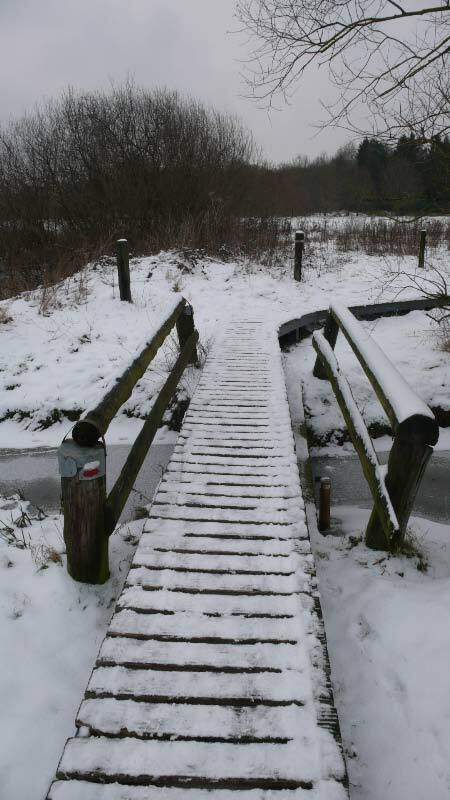 Finally figured out where it was at my left-hand side, anyhow once you hit the "knuppelpad" (an elevated wooden path over a wetland) you've gone too far. 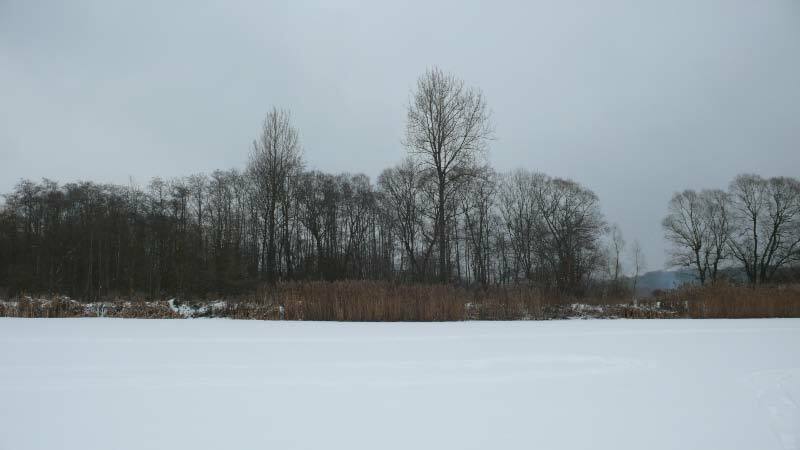 Covered with about 4 centimeters of last night's snow, I was unsure whether the ice would hold (as snow has an isolating effect), but it turned out to be as strong as concrete. 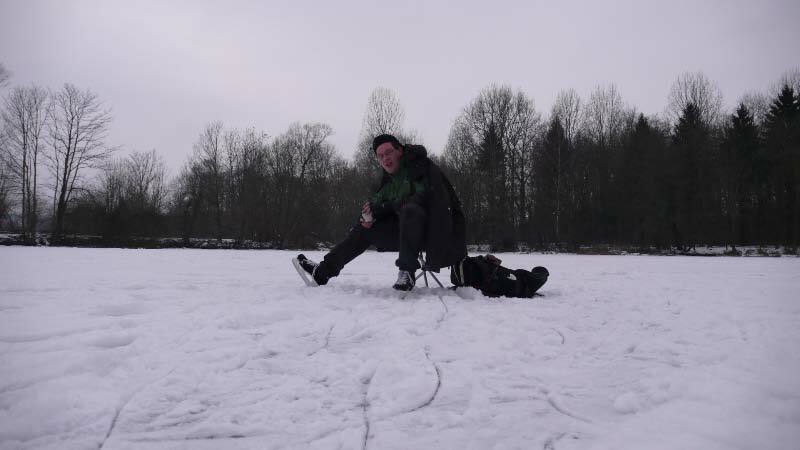 The rest of the afternoon was a real sporting relevelation, as the pond was about 200 meters long, and all afternoon there was no-one on the ice, except 3 fellow skaters, who didn't stay much more than an hour or so. 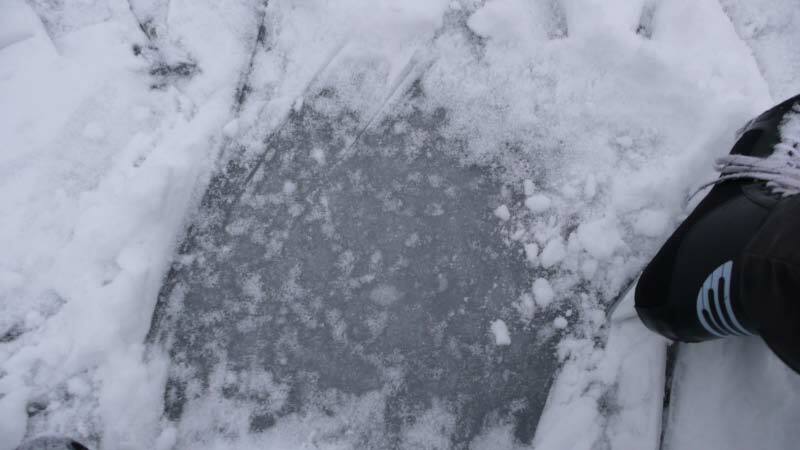 Indeed the quality of this natural uneven ice was not optimal, but still you could move really fast, with plenty of space and soft snow to catch you when going into a deep dive. Skated until plain darkness, and vacated this solemn arena after sipping a satisfying hot cup of tea. 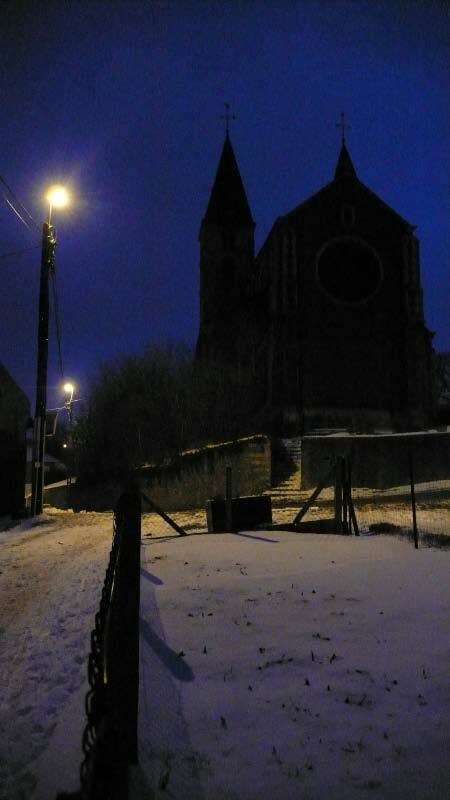 Easy parking near the church, and walk the dotted line | When you hit the "knuppelpad" (after this bridge) you've gone too far. Red/white sign on the left of the bridge indicates that this path must be on the SGR-512 (Sentiers de Grande Randonnée). No need for crowd control, believe this remains relatively quiet due to walking distance from the car. 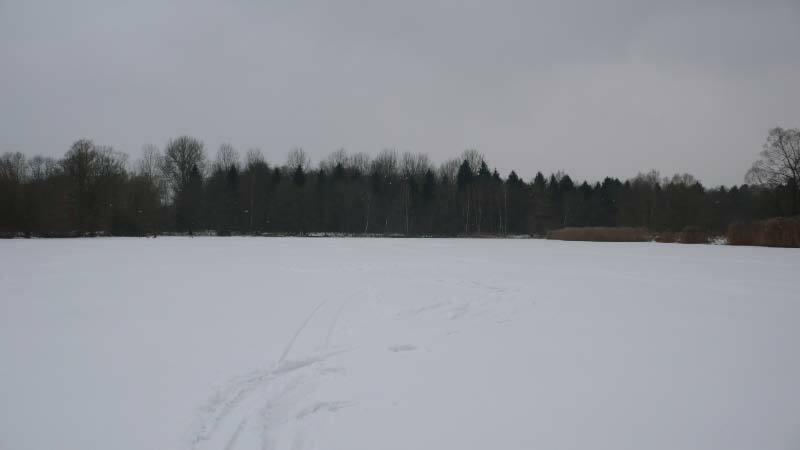 Pocked ice with about 4 centimeters of snow | Peacefully sipping tea. Church in Neerijse | Walking on Kunming lake in 1992 (me in the middle).